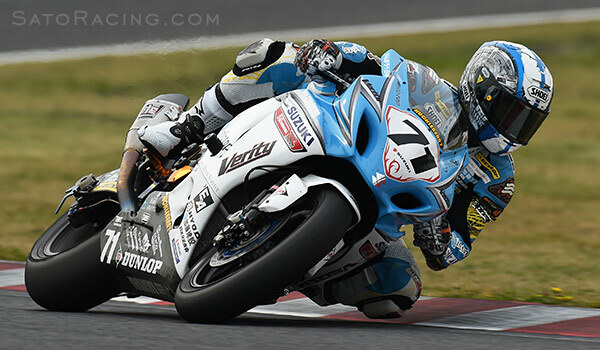 SATO RACING Rear Sets were born from extensive development and testing, not only on the street but also in World GP and All Japan Road Race (Super Bike, GP250, GP125, ST600) for more than 15 seasons. In recent years the company has also been heavily involved in developing parts for teams competing in the Suzuka 8 Hours Endurance Race. (Last year a majority of the teams in the race were using at least some of our parts!) 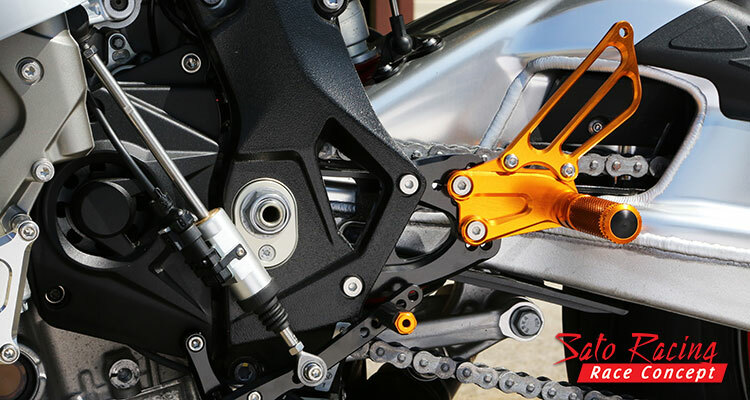 Many of the specialized Rear Sets developed specifically for the Suzuka 8 Hours have made it into production nearly unchanged as our Race Concept series of Rear Sets. But our standard ('street' friendly) Rear Sets and other parts have also benefited greatly from the lessons learned from our development for this grueling race. Our main goal in Rear Sets production is to give the rider an excellent all-around design with adjustable positions, along with smooth, intuitive operation and exceptional durability. We use double miniature stainless ball bearings for the shift and brake pedals, for smooth, precise movement that alleviates any looseness or wobble. We knurl our footpegs for non-slip characteristics during aggressive riding--- even the GP riders love the non-slip feel! Our pegs are adjustable so that you can choose your best position. Our Rear Sets are precision made, CAD/CAM/CAE designed and CNC machined. We give them anodized finishes which prevents oxidizing and scratches,while still allowing the texture of the metal to remain visible. On most models you can choose from Silver (clear metal), Black and Gold* anodized finish. You can choose from multi positions !! SATO Rear Sets feature multiple adjustable positions so that you can find the perfect stance for your size and riding style. The ranges of positions on our Rear Sets are optimized for the track, with most having the capability to move your feet higher up and further back compared to stock. 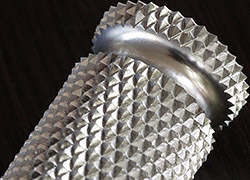 Additionally, many of our Rear Sets can provide a GP-style reverse shifting pattern. 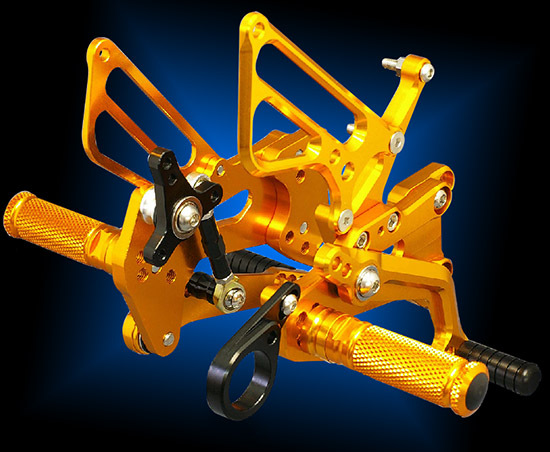 SATO RACING Rear Sets are designed and developed using feedback from many experienced racers to be the ultimate rear sets for the track - delivering high performance in as lightweight a package as possible yet durable enough for racing conditions. This lightweight design means we do not recommend them for stunt riding and wheelies. The peg bolts could fail under those conditions and we are not responsible if that happens. If you plan on stunt riding, stick with stock rear sets or get some other (heavier) aftermarket rear sets designed for that purpose. But if you are a serious racer who wants an edge on the competition, SATO RACING Rear Sets are the way to go. NEW 'Race Concept' Racing Rear Sets! SATO RACING's all-new 'Race Concept' series of Rear Sets are pure, no-compromise race-spec Rear Sets, designed for track-only bikes. These specialized Rear Sets utilize modular step plate designs to provide a wide range of positions that can move your feet significantly higher up and rearward compared to stock. 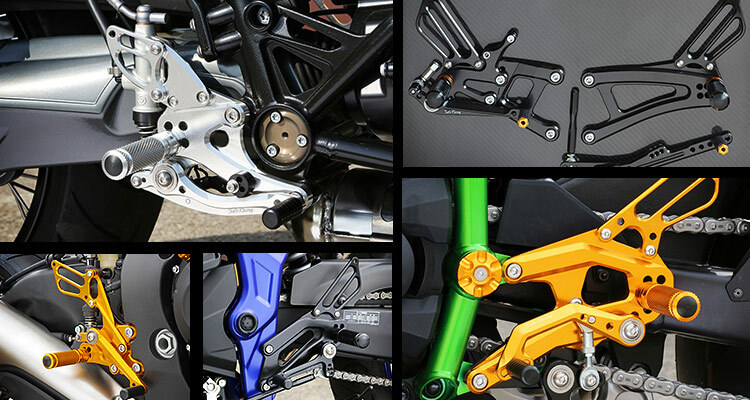 Click Here to view our complete lineup of 'Race Concept' Rear Sets. Note: Our 'Race Concept' Rear Sets are recommended for dedicated track bikes only due to the high position and lack of brake light switch / ABS compatibility on most models. Note: We highly recommend our Rear Sets be installed by someone with experience installing aftermarket rear sets. The instructions that come with many SATO Rear Sets are very basic, and assume the installer has done this before. SATO RACING's US office is mainly a parts distribution warehouse, so although we can provide general technical assistance, we do not have full knowledge every one of the hundreds of bike models we sell parts for, so if you feel you may need some handholding, you could save yourself a lot of trouble by having a certified mechanic experienced with your bike model install the Rear Sets. Aluminum anodizing is an electrochemical process that increases the thickness of a passive, naturally occurring, protective aluminum oxide film. Without this process, regular aluminum will corrode and become weak. Anodizing provides protection from these effects. One drawback of anodized GOLD is its tendency to fade with prolonged exposure to UV rays. Since this does not affect the primary purpose of anodizing - corrosion protection - Color fading is not covered by the Sato Racing warranty. Purchasers of Sato Rear Sets in anodized GOLD should also be aware that the shade of gold anodizing may vary noticeably from part to part. In addition, GOLD Sato parts are anodized in a unique tone of gold (deep, with hints of orange/ copper) that likely won't be an exact match with other anodized gold parts you may already have on your bike from other manufacturers. Sato Racing will not accept returns for full refunds on GOLD Rear Sets in situations where the customer takes the parts out of the packaging or begins an install, then decides they don't like the shade of gold. So if you decide to go with the gold, it should be with the full understanding of these limitations of gold anodizing.